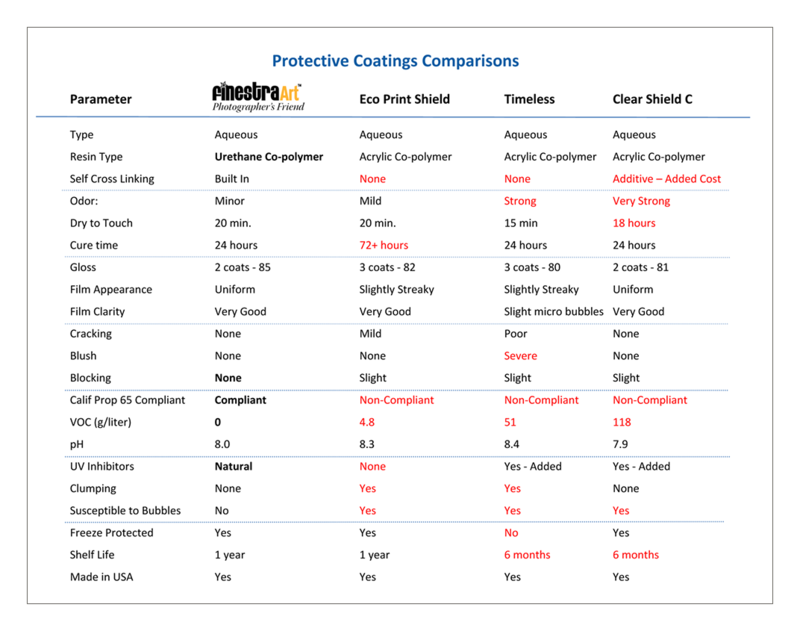 Finestra Art's, Photographer's Friend™ coatings and print protectants lead the industry for UV protection and scratch resistance (See the comparison chart at the bottom of this page). Adding these products to your finished prints ensures that your prints will last for generations to come. In many cases applying our coatings will double the prints display life before any appreciable fading occurs. Finestra Art makes spray on Photographer's Friend, lacquer based coatings for resin coated and fine art surfaces like: Glossy, Satin, Pearl, Luster, Metallic, Smooth Art, Velvet Fine Art and any surface that will not be stretched and bent. Our Photographer's Friend lacquer based products do not add new characteristics to prints but instead shield them from damage. While all inkjet prints can benefit from protective coatings, it is especially important with non-instant dry surfaces such as Finestra Art Metallic Silver and Metallic Gold as the spray will instantly set the inks when printed preventing any unwanted rub off. We also make roll on or spray on water based Photographer's Friend coatings for canvas. These coatings can and should be used on any canvas and are available in matte, glossy, and satin finishes which enhance and beautify printed work along with providing protection. All Photographer's Friend coatings protect against scratches, add display life and protect prints from harmful UV light and can up to double expected display life before appreciable fading occurs.